618 pages | 155 B/W Illus. 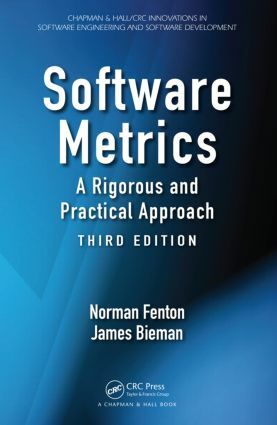 Reflecting the immense progress in the development and use of software metrics in the past decades, Software Metrics: A Rigorous and Practical Approach, Third Edition provides an up-to-date, accessible, and comprehensive introduction to software metrics. Like its popular predecessors, this third edition discusses important issues, explains essential concepts, and offers new approaches for tackling long-standing problems. This edition contains new material relevant to object-oriented design, design patterns, model-driven development, and agile development processes. It includes a new chapter on causal models and Bayesian networks and their application to software engineering. This edition also incorporates recent references to the latest software metrics activities, including research results, industrial case studies, and standards. With numerous examples and exercises, this book continues to serve a wide audience. It can be used as a textbook for a software metrics and quality assurance course or as a useful supplement in any software engineering course. Practitioners will appreciate the important results that have previously only appeared in research-oriented publications. Researchers will welcome the material on new results as well as the extensive bibliography of measurement-related information. The book also gives software managers and developers practical guidelines for selecting metrics and planning their use in a measurement program. "The wait for a new edition of this book is over. Long considered the go-to text for its thorough coverage of software measurement and experimentation, the new edition succeeds splendidly in bringing the field up to date while including new and important topics. … updated with the latest results from recent advances in software measurement research and practice. … The authors do an outstanding job of balancing formal analysis topics with examples that ground the reader in practical application. … Both researchers and practitioners alike will gain a valuable understanding of why measurement is critical for quality improvements in software development processes and software products. … With this updated edition, this book solidifies its standing as the most complete reference text for software measurement." "I have been using this book as my primary reference on software metrics for over 20 years now. It still remains the best book by far on the science and practice of software metrics. This latest edition has some important updates, especially with the inclusion of material on Bayesian networks for prediction and risk assessment." "Great introduction to software metrics, measurement, and experimentation. This will be a must-read for my software engineering students." "I have loved this book from the first edition and with each new edition it just keeps getting better and better. I use this book constantly in my software engineering research and always recommend it to students. It is so much more than a software metrics book; to me it is an essential companion to rigorous empirical software engineering." "This new edition of Software Metrics succeeds admirably in bringing the field of software measurement up to date and in delivering a wider range of topics to its readers as compared to its previous edition. I have both reviewed and used the book in my software measurement courses and find it to be one of the most advanced and well structured on the market today, tailored for training software engineers in both theoretical and practical aspects of software measurement. I look forward to continuing the use of the book for teaching purposes and am very comfortable offering my recommendation for this book as a primary textbook for graduate or undergraduate courses on software measurement. Thank you again for providing such a quality book to our software engineering education programs." "This book lucidly and diligently covers the nuts and bolts of software measurement. It is an excellent reference on software metric fundamentals, suitable as a comprehensive textbook for software engineering students and as a definitive manual for industry practitioners." Measurement: What Is It and Why Do It? Summary, Exercises, and Further Reading appear at the end of each chapter. Norman Fenton, PhD, is a professor of risk information management at Queen Mary London University and the chief executive officer of Agena, a company that specializes in risk management for critical systems. He is renowned for his work in software engineering and software metrics. His current projects focus on using Bayesian methods of analysis to risk assessment. He has published 6 books and more than 140 refereed articles and has provided consulting to many major companies worldwide. James M. Bieman, PhD, is a professor of computer science at Colorado State University, where he was the founding director of the Software Assurance Laboratory. His research focuses on the evaluation of software designs and processes, including ways to test nontestable software, techniques that support automated software repair, and the relationships between internal design attributes and external quality attributes. He serves on the editorial boards of the Software Quality Journal and the Journal of Software and Systems Modeling.